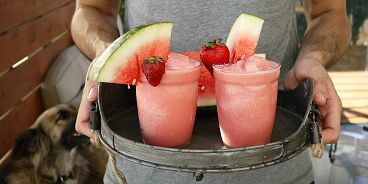 Summer is a time to indulge in icy cold, fruity beverages, and thanks to a post from Jillian Harris, I recently discovered the most irresistibly delicious chilled cocktail to ever hit my palate. And the good news is, it’s ridiculously easy to make. All you need is a small watermelon, a can of coconut water, some light coconut milk and coconut vodka (but if all you’ve got is regular I’m sure it’ll work just fine). First of all, slice your watermelon into one-inch cubes and place in the freezer (I lay them out on a parchment lined baking pan so they don’t stick together). Once they’re solid, add them to your blender (you may need something powerful like a Vitamix) along with the coconut milk, water and vodka. Play around with your quantities to create your perfect drink, whether it’s on the creamier side or the healthier, lighter side. To sweeten it up even more, I sometimes add a few frozen strawberries (and these are now in season, available at our local farmers markets).